Stained Glass Inc. windows, domes and lighting bring a special touch to any dining experience. Stained glass in restaurants is the perfect way to enhance visual aesthetics without sacrificing practicality. Transform your dining space by using stained glass partitions to divide dining areas. This unique method of division not only offers increased privacy for your patrons, it also serves as a great way to set the mood. Stained glass partitions are an excellent way to incorporate images or logos that will enhance your restaurants theme or decor. Imagine dining beneath a romantic stained glass dome or ceiling. Stained Glass Inc. offers a selection of domes and ceilings, all specially customized for your application. Another great use of stained glass in your fine dining establishment is through stained glass windows. Diners will appreciate how these windows block unwanted glares while still allowing light to stream through. 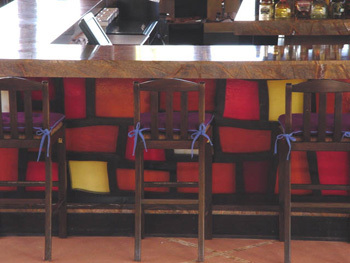 Additionally, they will enjoy the positive boost stained glass can bring to your restaurant's overall atmosphere. Illuminated stained glass is another great option for restaurants and other dining establishments. Consider hanging stained glass light fixtures above each table or even hanging a prominently displayed, custom stained glass sign. Whatever you desire, Stained Glass Inc. can make it happen. 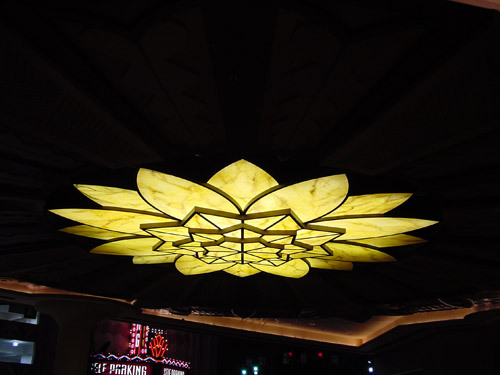 With interior illumination you may enjoy stained glass anytime, day or night, rain or shine. We provide stained glass advice and custom fabrication catered just to you. Call or email us for assistance.